Greendog: The Beached Surfer Dude! is a sidescrolling action game developed for the Sega Mega Drive and Sega Game Gear. 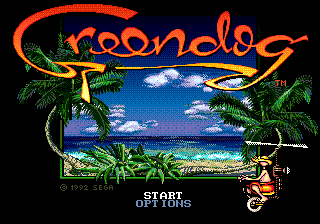 The game is based on an obscure board game called Surf Trip, created by Ric Green, published and released in 1988, by Surf Trip, Inc. (Manhattan Beach, California). Main article: Greendog: The Beached Surfer Dude!/Magazine articles.